But before you finalize on where you want to move, you should choose wisely, you should be strategic. Relocation should never be taken lightly. There are many critical factors to consider for a strategic relocation. This article is here to help you figure out, understand, and take into consideration all these key factors before you strategically relocate. Now most articles you’ll read about strategic relocation will focus on all the best an area has to offer – such as the amazing weather or proximity to the ocean or nearby amenities. But that’s only looking at half the equation. I’m a firm believer in choosing a place to live might not have the “best” of these but is a lower risk place to live. You can always visit and travel to “high risk but high reward” destinations. But as far as day to day living…give me a safe place. It’s no real surprise that a lot of people live in Urban environments nowadays. What’s shocking is just how many do. Using the US consensus data, about half of all US citizens live in or near an Urban environment. One of the biggest trends over the past few decades is how much more congested cities are getting. Not only are major cities getting denser but they are also sprawling out. But what’s that mean in the event of a major catastrophe? It means that if you live in one of the “danger zone counties“, you’re at extreme risk of resource depletion due to refugees. In a worst-case widespread disaster (such as a nuclear attack, EMP attack, etc.) critical resources like power, water, and food are depleted and people (millions) are forced to flee the city in search of resources. If such a situation does happen, this mass of fleeing humanity will be desperate. They will be severely dehydrated and likely starving. This urban mass exodus of desperate unprepared refugees from the majority cities has been coined by some a Golden Horde. So if you have any concerns regarding population density (and you should), you’ll want to remove any locations with a high population density from your list of relocation options. If you live in a high-density area, even if you’ve taken action and prepared for such an emergency disaster, via water storage and food stockpiling you’ll still have millions of desperate people surrounding you. So instead of being overwhelmed by this horde of dangerous people, you may instead prefer to strategically relocate to avoid this situation altogether. Bug Out Bag Checklist, Bug Out Vehicle, Bug Out Location, Homesteading. Lets talk about natural disasters. There are several varieties of natural disasters that can affect the United States but they’re focused in certain regions. So it makes sense to consider the odds of being hit by one of these major natural disasters to your strategic relocation decision. If you want to avoid relocating to an area at high risk of these regional natural disasters, you’ll have to toss out much of the country. Now I look at flooding as a localized disaster. What I mean by that is, even if you live in a region with flooding risks, if you can avoid buying a home in or near a floodplain. By doing so, you reduce your odds of getting caught up in those regional floods. So with that said, the States that carry a lower risk of major natural disasters are Michigan, Montana, and Ohio. While many states have areas within the state that are relatively safe such as parts of Texas, Colorado, Minnesota, etc. There’s no such place that has a zero percent chance of avoiding natural disasters. For example, on the map above, Michigan looks safe but Michigan is known for brutal winters and lake effect snow storms. They’ve lost power for days or weeks in the past. So being strategic when it comes to avoiding natural disasters is not an all or nothing proposition. It’s all about looking for areas of lower risk. Sorry folks but Flordia and California are not lower risk options. Hurricanes, Earthquakes, Wildfires, and even Tsunamis make these beautiful coastal states high-risk places to relocate. Instead, choose a lower risk area of the country and visit those high-risk areas from time to time. I strategically relocated to a small town in Colorado where theirs a zero percent chance of hurricanes, a low chance of tornados, low to moderate chance of an earthquake. My biggest concern is wildfires, which I manage with insurance and defensible space tactics. We all know nuclear isotopes is nasty stuff to humans. Whether it’s a stockpile of nuclear weapons or waste, nuclear energy plants, or a nuclear target doesn’t really matter. When it comes to nuclear if something goes wrong, the further away, the better. And it’s not only the exact location where a nuclear disaster takes place, with a nuclear attack the other big concern is fallout. You want to consider prevailing winds in your strategic location. Why? Because you might live in a remote area but what happens if it’s 250 miles due east of a major city? Fallout that’s what. If a nuke ever drops on that major city, where’s the fallout going? You’re backyard! So as you can see, much of the USA is susceptible to a nuclear disaster either through a direct attack or indirectly via scattered fallout. Some areas least likely to experience nuclear fallout include Oregan, parts of eastern Iowa and southern Wisconsin, Mississippi, Kentucky, etc. Using maps like these help you make better strategic relocation decisions to try to avoid a nuclear disaster altogether. 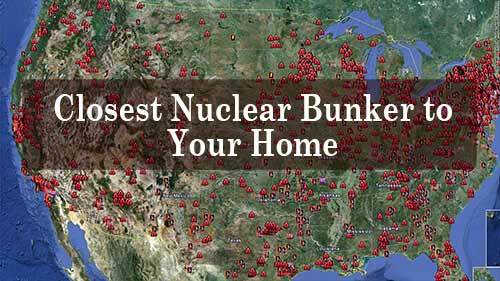 You can either find a fallout shelter near your home or you can avoid the hazard altogether by strategically relocating. It’s safe to assume you like low crime, solid education, great health care, things to do and a stable economy. So if you’re looking to strategically relocate, you want to find a place that ranks well on those “Quality Of Life” metrics. However, this is a tricky decision because the “best counties” might to too expensive for you to relocate. So the majority of us are looking for a Goldilocks situation – not too hot or too cold. Or the best with our financial means. Extremely expensive places to live are a major burden to the typical American budget. If you’re looking for a place to strategically relocate to but discover it takes a million dollar home to live there…let’s just say that may be outside of your budget. The key is to focus on counties in the yellow, light blue, and dark blue areas. But be on the lookout for too expensive for you as well. Some of these area’s that offer the “best quality of life” might be outside of your financial means. This one may or may not matter to you. For some, it might matter a lot and you’ll use this as your initial strategic relocation filter. For others, you may not even consider this important to your decision at all. But for those who care, it’s important to understand what the political leanings are of the county you’re looking at. Is it a dark red (votes Republican) county in rural Texas? Or is it a deep blue county (votes Democratic) in along the eastern seaboard? A political map help to give you a general sense of how people who live in a county thinks. Most people prefer to live near others who are like-minded – who share similar beliefs in morals and politics. Just remember, this is only a recent snapshot. Many counties flip back and forth depending upon many factors. This is a single data point out of many. If the political makeup of an area is important to you, make sure to visit these interactive maps to sort through more data to help with your strategic relocation decision. Here’s the good news, the United States is a very diverse country with a ton of options to consider for your upcoming strategic relocation. The bad news is with so many options, it’s easy to get overwhelmed by all the choices. So here’s how I suggest you utilize this data to zero in on the best relocation options for YOU. First, decide which of the following considerations are most important to you and your family. Is it safety? Is it Quality of Life? Or maybe it’s political. List each of these factors from most to least important to you. After you’ve done this, you can then start with the most important factor and start eliminating places from your list. Each time you add the next filter, you’ll start reducing the places that are best for you relocation. Once you’ve filtered down several times, you’ll be left with just a handful of areas to consider in more detail. That’s how you go from an overwhelming number of choices down to a handful. One tool you absolutely need to invest in is Joel Skousen’s book called “Strategic Relocation“. This book is chalked full of detailed useful information for anyone who’s looking to strategically relocate. It’s a must own relocation resource with a massive amount of strategic relocation information. Did I miss any criteria you feel should be on this list? Where are you thinking about strategically locating to and why? Let us know in the comments below. I’d add Rockingham County (Seacoast), NH. It’s just North of Boston and where many from the city might head after SHTF. Thanks for sharing. Should be very helpful for other survivalists living in the Rockingham County area. That golden horde scares me! I was reading another survival site the other day and they had written something that scared me even more! They talked about a Military Coup which with all of this “anti gun” propaganda it has me worried. What do you think is more dangerous for the golden horde scenario: A military Coup or an EMP or Cyber attack? It all depends on the level of severity of any event. Any of these events taken to the extreme will cause mass chaos and possibly a Golden Horde of people leaving to find food and resources. For instance, if a military coup causes mass rioting and looting do you think your local groceries stores are going to restock once everything becomes looted? No way, not until things settle back down. So if rioting escalates and continues, food and resources will become scarce and people will start vacating the high-density population areas. If an EMP knocks out the electrical grid for months/years, same result. The one thing that is common to creating a Golden Horde is people being pushed into sever desperation. Having no food, no water are the 2 primary things that will turn people into animals. These people will start to attack each other and vacate cities to look for resources. Not a place you want to be anywhere near. Is that an ordered list, ranked by most dangerous? If so, how were the rankings calculated? Or is it just an unordered list based on population size or density? It’s a list of all the counties in the USA that have a high population density. It is not listed in any particular order. If your county is listed and SHTF, you better have a plan to get the hell out of there…fast. I am new to this and my plan was to wait it out at home if possible. Now I happen to find your list of dangerous places to be when SHTF. I am in one of these counties. Now my prepping for food and water supplies goes out the window? Here are a couple more articles for you to read to help you figure out your personal survival plan. Should I Stay or Go? Bug In Vs Bug Out. Don’t forget urban areas that do not have county status. Virginia Beach, Virginia consumed Princess Anne County and became the largest city (by area). It is also very highly populated. The entire region of Virginia around Yorktown, Newport News, Norfolk, and Virginia Beach is one big metropolitan population center. And they all have their backs to the Atlantic Ocean. They can only flee inland. one of the safest places to be is Saginaw, TX. They have some of the largest grain storage facilities in the world. no one is going to be starving there. It’s in tarrant, co, but you don’t get any more conservative that this place with lots of preppers here. I live walking distance from the grain. There’s lot of fresh water available in the immediate area. everybody owns guns. it’s in tarrant co. tarrant co is a massive county with lots o rural aspects.